The weary nurse at the base Family Practice Clinic shoved a lock of hair out of her eyes and waited expectantly for my answer so she could fill in my paperwork. In that moment a couple of decades ago, I came to the stunning realization that military spouses usually come to at one point or another. No one associated with the military would ever likely be interested in my information again. I was a dependent. Like most military spouses of a few (ahem) years, I can now rattle off my husband’s Social Security number with ease while I have to think for a moment to remember my own! The popularity of the movie American Sniper has done a lot lately to highlight the impact of war and military service on families, and for that I’m grateful. But for those of us who’ve been around the block a time or six, we already know that while military life isn’t the only thing that defines us, it does become a part of the fabric of who we are. How can it not? We’re asked to sacrifice time with our loved ones for months or years at a time. We move across the country or around the world, often with very little notice. Our own careers are affected by relocations, and we watch our children make the transition of being the “new kid” over and over. Yet when we see our military member in formation, hear the National Anthem, or drive onto the installation, we couldn’t be prouder. We’ve invested hours, sweat, and tears—yes, our very lives--into this venture called military life! As I think back over the past 26 years, a few things come to mind as to what I consider the essential qualities or "must-haves" of a military spouse who laughs at what life throws their way and carries on in spite of challenges. 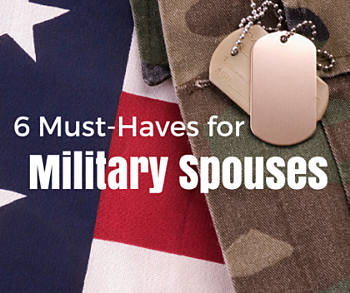 What would you add to this list of must-haves for military spouses? 1) A sense of humor. You’ll need it when the dishwasher leaks across your freshly mopped floor, the baby’s fussed all night, and your eight-year-old breaks his wrist…all on the first day of a long deployment. You’ll need it when you knock over your drink at a military banquet...in front of your spouse’s boss. You'll need it when you unpack a box that was loaded 3 months ago overseas by movers who chose to thoughtfully pack your dirty dishrag and kitchen trash. Learning to laugh at the ridiculous and the inevitability of Murphy’s Law will go a long way towards making these situations bearable! Staying open to change and new experiences will make for an adaptable military spouse. Don’t be afraid of the unknown; different doesn’t equal bad, and military life can be a great adventure! You'll also need to learn how to bend, not break, as you face decisions about careers or whether to move or stay put during deployments and short tours. 3) The ability to recognize true friendship. Some of your best friends will have lives with no resemblance to yours. You’ll learn quickly that rank and jobs have nothing to do with true friendship. The friends who drop by unannounced with a casserole during deployments, drive you to the ER when you’re running a 103 fever from pneumonia, watch your little ones when you need a break, sit on your front porch and swap stories over a glass of wine, cry when you move away—those friendships will prove to be absolutely priceless! 4) Giving yourself permission to take care of you. It’s ok to say ‘no’ and not feel you have to do it all. Military spouses are known for their volunteerism, but set limits and healthy boundaries for yourself. It’s no shame to admit you need a breather, so be proactive vs. reactive. Some of us need to have time with friends; others must have quiet to recharge. 5) Knowing where to find help—for yourself or others. Do you know a chaplain or counselor familiar with military family struggles? Free and confidential Military Family Life Counselors are located on many installations. Learn what resources are available. Each branch of the military has family services that provide programs, services, people, and agencies for the support of servicemembers and families. These are a wealth of information with resources from career counseling to retirement transition to grief counseling. You don’t have to actually know all the answers in a tough situation requiring help, but knowing where to find the answers will be invaluable! Even if you’re a crusty old spouse like me, never forget how it felt when you were new and you couldn't understand the acronyms, never mind the weird customs and unwritten laws of the military world that everyone else seemed to know but you--we’ve all been there! Kindness is underrated these days and can be a lifeline for someone struggling. Remember the saying: “Be as kind as possible. Everyone is carrying some sort of burden.” Never let an opportunity pass to be kind and encouraging! To the above ingredients add 2 tablespoons elbow grease and let stand alone for one year. Marinate frequently with salty tears. Pour off excess fat and sprinkle ever so lightly with money, then knead dough until payday. Season with international spices. Bake 20 years or until done. Makes unlimited servings.